Praise the Lord! 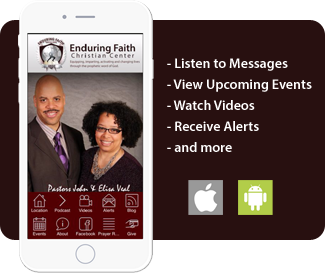 We thank God for you for visiting the official website of Enduring Faith Christian Center. We welcome you with the love of Jesus Christ. Take a look around! Hope that you will visit our church as the Lord leads. Founding Scripture: Matthew 24:13 – But he that shall endure unto the end, the same shall be saved. We are a nondenominational, apostolic, prophetic ministry that adheres to the unadulterated, uncompromised word of God. We are a ministry that moves strongly in the prophetic. We are a deliverance ministry. The Bible is our final authority. Jesus Christ is the Author and Finisher of our faith. Our desire is to thrust people into the calling that God has upon their lives. We are not religious traditions, but by the Spirit of God. We truly love God’s people and maintain a reputation for healing the wounded, not killing them.